I got my novice ticket in 1978 at the age of 13 and was given the call sign KA1BXW. Within a couple years I worked up to Advanced Class and got my current call sign, KA1VE. My first rig was a Yaesu FT-901-DM. 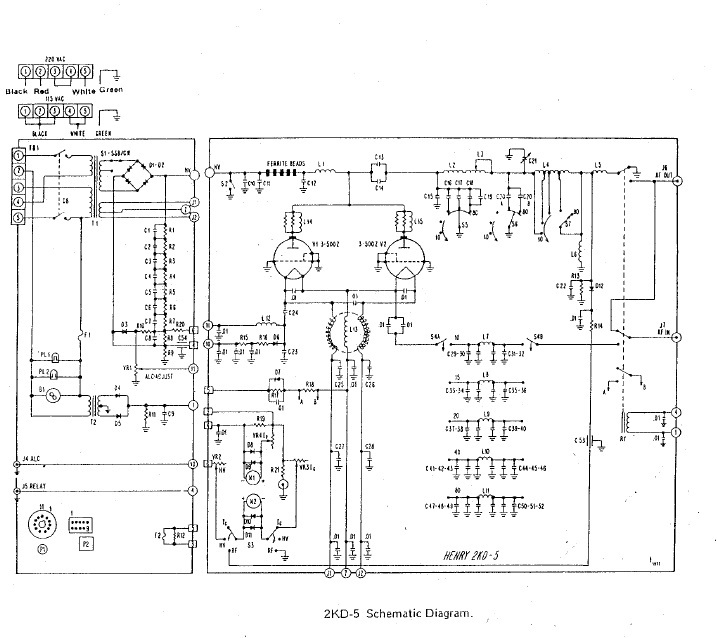 In May of 1980 my parents bought me a Henry 2KD-5 linear amplifier. I still have the original sales receipt showing a purchase price of $845. The serial number is 44-455. I used the 2KD-5 with my FT-901-DM until the fall of 1983, when I went off to college and abandoned ham radio. The equipment sat in my old bedroom for 32 years without being used. It was never moved and was never turned on. It was like a shrine to my lost hobby. Over the years I took care to renew my license. During visits to my parents I would sometimes look at the old equipment and the fading QSL cards hanging on the wall. But it took awhile for the bug to bite again. In early 2015 I decided I wanted to get back on the air. 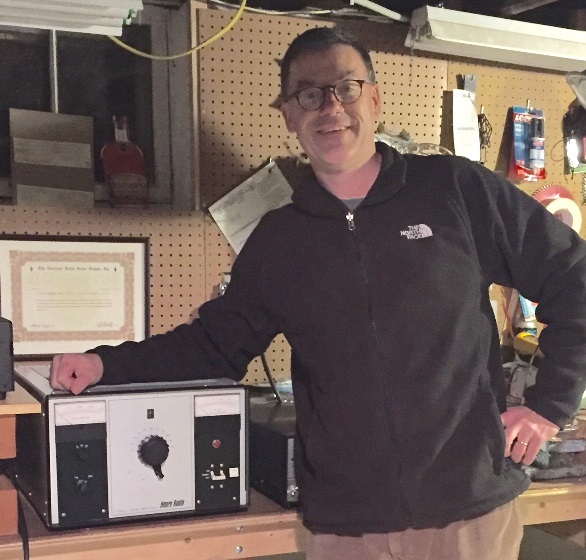 After Burghardt Radio Repair serviced the FT-901-DM, I turned my attention to the 2KD-5. At 70 pounds it was awfully heavy to ship so I wanted to get it going myself. Fortunately I found a great mentor: Fred Gerken, KC5RT. Under Fred's guidance I was able to bring the 2KD-5 back to life. Here is how I did it. The first problem I encountered was a simple wiring issue. I wired an outlet in my shack for 240 volts and 15 amps and put a new four-wire plug at the end of the 2KD-5's power cord. I wired the outlet and plug so that red and black were hot, white was neutral and green was ground. When I flipped on the 2KD-5 for the first time, the fuse at the rear of the unit (the 3AG, 1.5 amp fuse) promptly blew. It turns out that the Henry factory wired the power line terminal strip (found at the rear of the unit, covered by a little metal plate attached by two screws) so that white and black would be hot and red would be neutral. 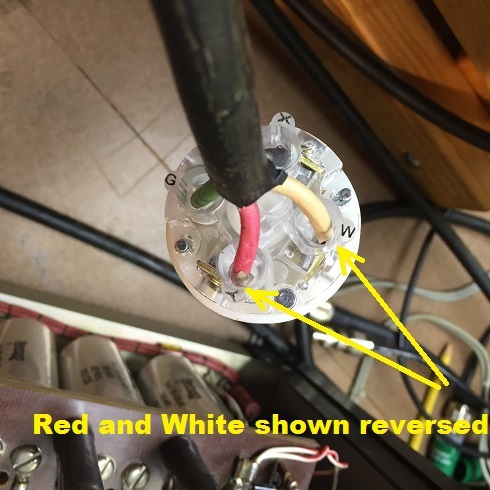 Once I switched the positions of the red and white wires on the terminal strip, the initial problem was solved. The two hot wires (red and black) are now at positions 1 and 5 on the strip (the far left and far right positions), white is now at position 2 for neutral, positions 3 and 4 are bridged by a jumper as they were before, and green remains grounded separately where it always was. Once the 2KD-5 was powered on properly, all the lights lit and the blower started blowing. With the amp switched to CW mode, the resting plate voltage was 2,000, as the manual predicts. But when I switched the amp to SSB mode the meter pegged at over 4,000 so I quickly switched back to CW mode and then cut the power. There were several possible suspects, but the most likely culprits appeared to be bad filter capacitors or bad wire-wound bleeder resistors (or possibly both). Given my very limited testing equipment and technical knowledge, I decided I would just go ahead and replace C1-C8 and R1-R8, as well as C9 and R9 for good measure. I thought about replacing R10 but never did that. C1-C8 are screwed into the underside of a long and thick terminal strip that runs along the right side of the 2KD-5. The manual says that these eight capacitors are supposed to be 190 uf. The ones that were actually installed, however, were 180 uf. With one possible exception, there was no real sign of any capacitor leakage, but I removed them all anyway. 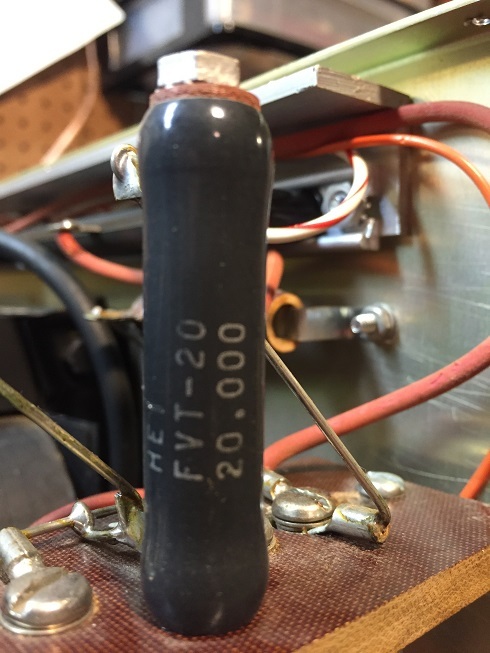 I replaced them with a set of eight 210 uf capacitors that I bought from Harbach Electronics for $120. (Henry Radio has a set for the same price but the uf varies from 160-270 depending on what they have in stock, and another vendor is asking $190 for a set of 160 uf). 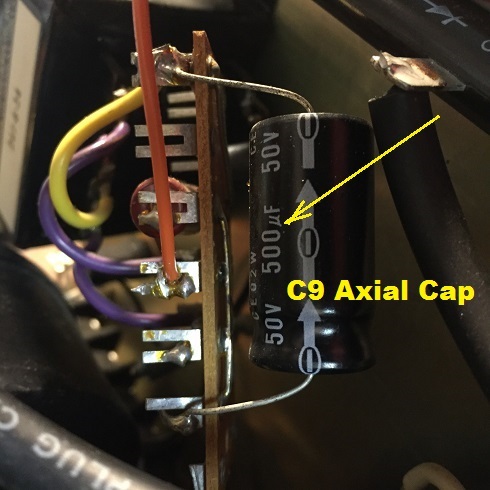 These new capacitors were identical in size and shape to the originals and they screwed in nicely into the original positions on the terminal strip. The old capacitors had red plastic washers on top, apparently to create some air space between the tops of the capacitors and the underside of the terminal strip, but I learned that these were unnecessary and did not use them when I installed the new capacitors. R1-R8 are installed just above C1-C8 on the same large terminal strip. They are held in place by a slender bolt that runs through the hollow space in each resistor, with the head of the bolt appearing on the underside of the terminal strip and the nut and washers secured at the top of the resistor. I ordered a set of eight replacement resistors from Henry Radio for $80. The new resistors were a little thicker than the originals but the same height. They fit reasonably well into the positions occupied by the old resistors, using the original hardware (which I carefully preserved). I was even able to reuse the bare wires on top of the terminal strip that connect the resistors and the capacitors. I just clipped out and unscrewed the old resistors and then screwed in and resoldered the new resistors. After I removed the old resistors I tested them. Seven showed expected values but one read zero. C9 is located on a little terminal strip mounted at the left rear of the unit, near the blower. The manual says it is 500 uf and 25 vdc, but the one actually installed was 50 vdc. My local electronics store had a 50 vdc replacement that cost only a couple bucks. It was about half the size of the original, however, and the leads were barely long enough to reach the connections on the terminal strip. Still, I managed to solder it into place. Obviously, in replacing all the capacitors I took care to maintain the correct polarity. R9 is attached to its own metal bracket that is mounted on the right rear of the amp. This bracket is located near the end of the large terminal strip that houses C1-C8 and R1-R8. I found a replacement resistor from Mouser Electronics for $5.78. It is roughly the same size as the original. After making these fixes, I powered up the 2KD-5 and all seemed well. The plate voltages were a little lower than expected (1,800 on CW and 2,800 on SSB), but apparently still within the acceptable range. The tubes glowed a yellowish-white. This was of some concern because the manual and various commentators say that the proper tube color ranges from "dull cherry red" to "bright orange." I overcame my doubts, however, and decided to give the amp a whirl. After making some stupid tuning mistakes, I went on the air with the 2KD-5 and the FT-901-DM, pumping out about one kilowatt according to my meter. So far my signal reports have been good even though the various meter readings are not exactly where they should be after tune up. My first report on 40 meters was 20 over S9 - not too shabby for gear built in 1978 and 1980 attached to an inverted-V dipole suspended only 25 feet above the ground. At some point I may want to replace the blower, which is quite loud by today's standards. But for now it appears that I am in business with a newly restored vintage station powered by Henry. Total cost of the repairs: about $210. Market value of the working amp: over $1,000. Sentimental value: priceless. A special thanks to Fred, without whom none of this would have been possible!